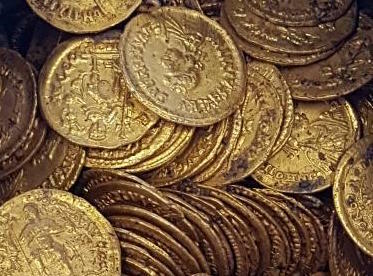 Hundreds of ancient Roman gold coins have been unearthed on the site of an old theatre in northern Italy. The coins date back to the end of the Roman Empire and were discovered in a soapstone jar in the basement of Cressoni Theatre in the city of Como, north of Milan. “We do not yet know in detail the historical and cultural significance of the find ,” Italy’s culture minister Alberto Bonisoli said in a press release. The coins were discovered last week and were taken to a restoration laboratory in Milan where archaeologists will study them. While experts are yet to place a value on the coins, the Italian media has predicted they could be worth up to millions of dollars. Cressoni Theatre opened in 1870 and was later converted into a cinema before closing in 1997. The building was set to be demolished, but work at the site will now be put on hold to allow for further excavations, according to Italian officials.